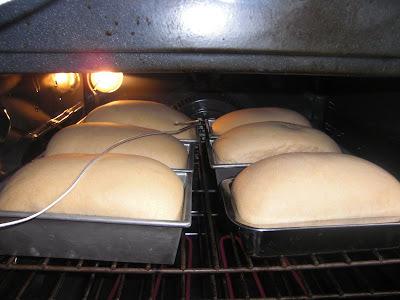 My biggest battle with my bread for 5 years was figuring out when it was done. I seemed to always have a raw loaf, or one overdone...of course it doesn't help when you are cooking 6 loaves in one oven! Three months ago, at my sisters advice I purchased a temperature probe. What in the world took me so long to do this? It is an amazing gadget. I paid $20 for it at my local kitchen store. 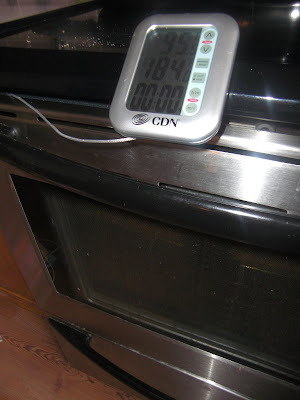 I simply set the desired temperature (for my bread below, I like 184 degrees) and insert the probe. It beeps when the temperature is reached. I put the probe in a loaf. It is a bit consuming the last 10 minutes of bread making, because my front loaves are done almost a full 10 minutes before my back loaves. But every loaf has been baked to perfection. And to think I battled this silly problem for so long. I'm sure all you other bread makers may have known about these before but if you haven't it is a worthy investment. I think they get pretty fancy with wireless sensors you can wear around your house...if I ever move into a "McMansion" I will keep that in mind. Mine is a brand called CDN, model TSP572. It also works perfect for my tootsie rolls and meat.